The guy dropped a transmission on his hand, went to urgent care, got stitched up and then competed the next day against Matt Field. You can relive that wild weekend on his saved Instagram Story of Long Beach. While you are on his Insta, go ahead and watch his off-season failed jobs working at a local wrap shop and Action Clutch. These two skits are the best drift content to be released in the last 10 years easy. The tandem battle dubbed the “Birthday Battle” really brought the best out of both these drivers. A battle that clearly belonged in the Final Four was tucked way back into the Top 32 this year. If you missed Top 16, I recommend digging up the stream on YouTube (4:13.29) and enjoying this battle. Its not the most technically proficient display of the weekend but it wins a 10/10 for excitement and full all out 100% drifting from two masters of the sport in tandem. The Napoleon Motorsports team was set to debut an all-electric Chevy Camaro this weekend but due to regulations outside of everyone’s control the car couldn’t turn a wheel on his rookie debut. These issues happened right before practice day on Friday so I imagine most drivers would experience a huge issue with the mental stress and complications of this car change. Travis Reeder quickly just pulled his S13 out of the trailer and rocked it in qualifying and locked in 19th! He then took out Alex Heilbrunn in Top 32 and had put down a great battle with Piotr Wiecek and lost. He has a clear lead and strong start for Rookie of the Year! 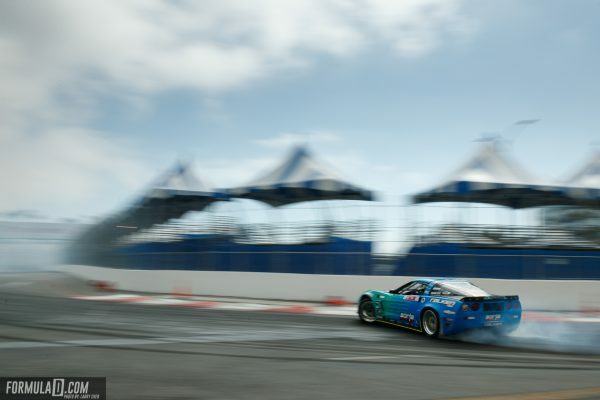 Sometimes I dream of the days when Formula Drift turns to a single tire manufacturer (like NASCAR AND F1) but this weekend at the Streets of Long Beach was quite a campaign against this notion. The podium featured three of the current four tire manufacturers showing that the diversity of these products is still very close and competitive. Forrest Wang looked the best and most consistent during the practice sessions. He was a strong candidate for a podium finish early on in the weekend. 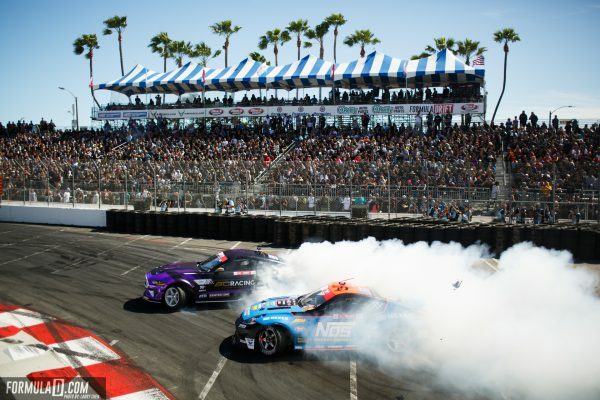 Forrest Wang did have a wild trip to the finals beating Vaughn Gittin Jr., Piotr Wiecek, and then Fredric Aasbo to land another place in the finals this season. 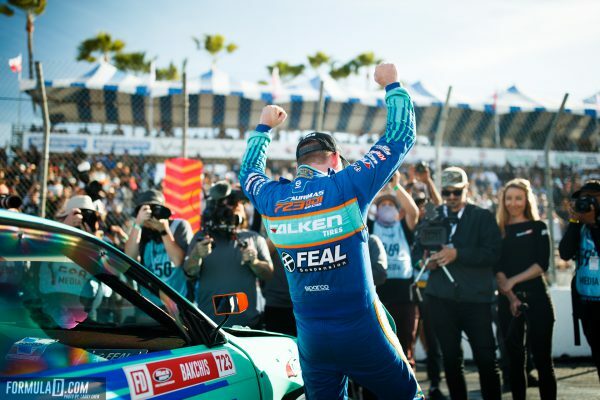 Unfortunately, his final battle ended like it did last year in Long Beach with a loss. This gives Forrest Wang a sixth career podium but still zero victories to his name. 5. What Happened to James Deane? The Worthouse team brought out two virtually new S-Chassis S15s out this season to avoid the inevitable racecar fatigue. The plagues of his new build came out to haunt him with some serious issues with his nitrous system. He also commented that his car going in motion without his foot on the gas. In reality, James Deane got lucky to make it past Dean Kearney in Top 16 who had serious overheating issues or could have better capitalized on Deane’s huge mistake in the chase. In order to three peat the championship Deane’s team will need to really button up this car before Orlando. Once again the 100 point score given to Tanner Foust back at Sonoma Raceway is safe by just one single point. Matt Field blasts out in his Corvette earning a solid score of 99 while losing just one point in the style category. 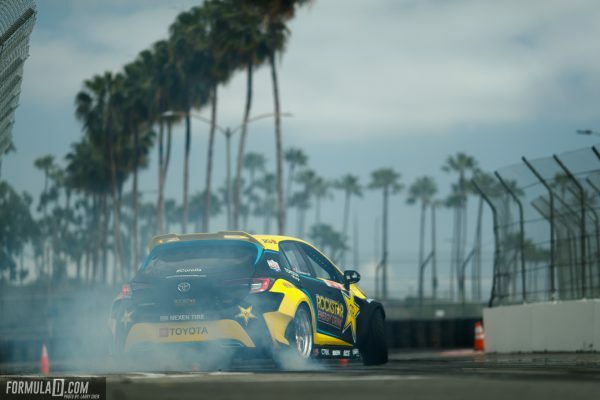 The reality is Tanner Foust’s old 100-point run probably wouldn’t even earn him a 90 in this modern day of Formula Drift but he stills is the single holder of this record. 3. Odi Bakchis Wants that Championship! Odi finished the 2017 season in third place behind James Deane and Fredric Aasbo but really struggled to make such a big statement in 2018 and wound up finishing in ninth place. The 2017 season saw him take home a victory at Wall Speedway and have several amazing performances during that season. The 2017 Odi Bakchis seems to be back and ready to win his first championship with Long Beach being just the start of this new season! 2. 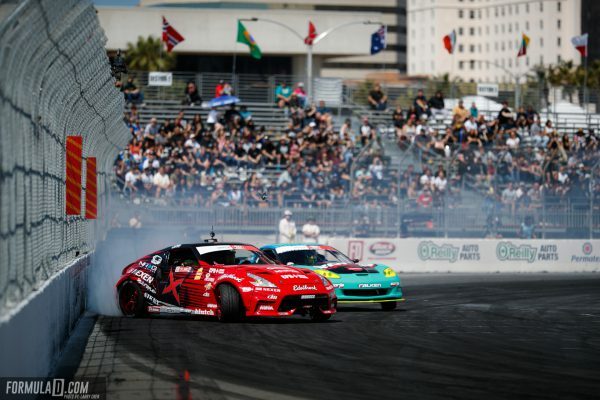 Can Ryan Tuerck Return for Orlando? 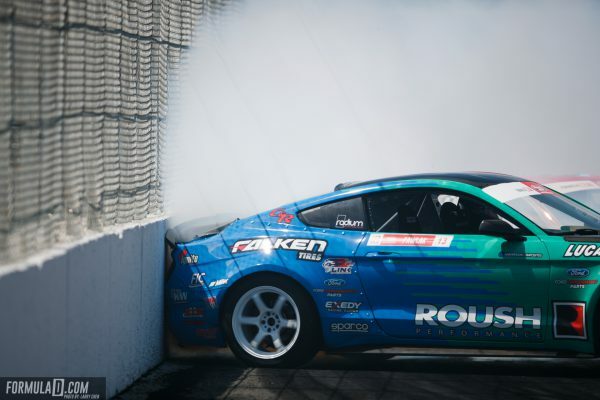 The Ryan Tuerck crash looked pretty bad at the end of Top 32 practice on Saturday morning. According to Instagram he has bruising, a concussion, and whiplash from the hard hit. Thankfully his safety equipment and the tires kept him relatively safe. The frightening thing now is this power steering failure might have written off his Toyota 86. Tuerck says the photo he posted is the last time he will step out of this car implying it’s a total loss and the team is still making plans for Orlando. What a huge blow to Ryan Tuerck and team from a mechanical failure on track. Hopefully they can build or source something before Orlando Speed World in just over a month. Laurette Nicoll pulled Fredric Aasbo over trackside and really pulled some very interesting facts about the setup changes he and his team made over the off-season. Fredric reverted back to a setup style that he used from 2008 while eliminating a lot of suspension jacking and some toe-in. It is interesting because the Papadakis program is always known to be on the front line of the sport. Could this signal a turn back to an older style of drift setups to be competitive in this new season or the future?